Jinny Beyer is a legend in quilting. She has been quilting for 40 years and has been winning awards for most of that time (for some examples, read her bio from JinnyBeyer.com). Jinny was inducted into The Quilters Hall of Fame (1984) and in 1999, her quilt Ray of Light was chosen as one of the 100 Best Quilts of the 20th Century. If you are not yet familiar with the excellent work of Jinny Beyer, this pattern will be a good introduction. She designs world-renowned fabric for RJR Fabrics and has published twelve books and hundreds of patterns. Please check out her site! 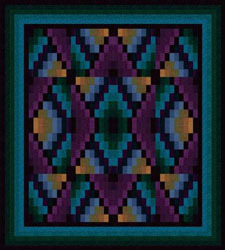 From JinnyBeyer.com: "Navajo Sunrise is a bargello-style quilt reminiscent of the rug patterns woven by native Americans. 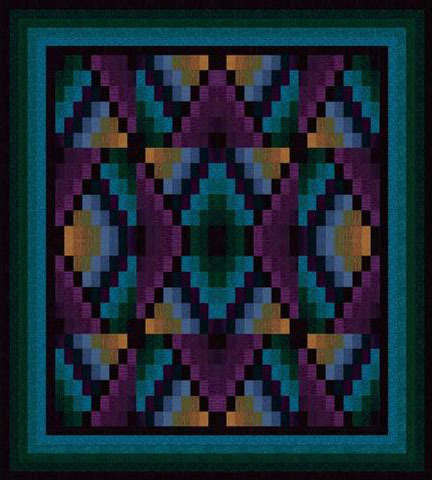 The design is created by arranging a repeat of mirrored and non-mirrored versions of a single block. "Rotary cutting and strip piecing make the construction of the blocks both quick and easy."